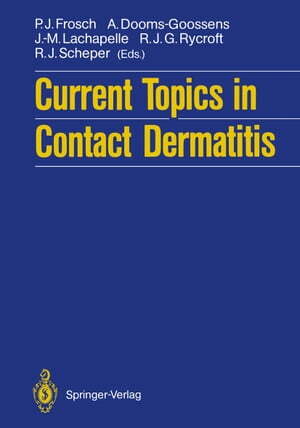 Collins Booksellers - Current Topics in Contact Dermatitis by K.E. Andersen, C. Benezra, D. Burrows & others, 9783642742996. Buy this book online. In recent years the field of contact dermatitis has increased greatly in importance in dermatology. The variety of exogenous, environmental­ ly caused dermatoses has undoubtedly expanded over the past few de­ cades with the increasing number of potentially toxic chemicals, the changes in lifestyle, and the greater life expectancy in industrialized societies. The value of international cooperation in this field has long been realized and acted upon by the International Contact Dermatitis Re­ search Group (ICDRG). By 1975 the international journal Contact Dermatitis had been founded under the editorship of C. D. Calnan. Thanks largely to the ICDRG and Contact Dermatitis, there were, by 1986, enough additional dermatologists and scientists with a special interest in this area to form the European Environmental and Contact Dermatitis Research Group (EECDRG). Within 2 years they had in­ stituted the European Society of Contact Dermatitis (ESCD) as an in­ ternational forum for researchers in the field. The EECDRG decided to hold a symposium in Heidelberg in May 1988, an initiative supported by the ICDRG, and on this occasion the new ESCD held its inaugural session. The Society already has over 200 members and most national contact dermatitis research groups in Europe are already represented; new members are of course welcome. Subgroups and working committees have been formed to address var­ ious topics including the standardization of patch testing, photoder­ matology, and bioengineering.